Are All Indexes Created Equally? Home > Resources > Truepoint Viewpoint > Investment Management > Are All Indexes Created Equally? A passively managed index is often the most efficient equity portfolio an investor can employ. However, as Wall Street recognized the indexing boom as a business opportunity, investing in index funds has become far more complicated. Consequently, buyer beware—alternative indexes have been introduced and marketed as an improvement upon traditional market capitalization weighted indexes, but generally lead to less-efficient and more costly investing. Threw you right into the middle of it, didn’t we? You might wonder what this means and how it impacts you. Well, first, let’s define some terms. An index is a group of securities intended to reflect the return of the market or segment of the market. And, market capitalization is the total market value of a public company (calculated by multiplying the stock price by the number of shares outstanding). In a market capitalization weighted index, the weighting of each stock in the index is determined by the stock’s market capitalization relative to the total market capitalization of all stocks included in the index. This is an efficient structure for an index fund because as a stock’s market capitalization varies over time with price changes, its weighting in a market capitalization weighted index inherently adjusts (without requiring the sale or purchase of shares). Originally, investment vehicles tracking indexes were introduced to provide investors with efficient access to broad asset-class segments. However, a recent Vanguard study reveals that the once simple concept has been transformed into a practice of product placement for Exchange-Traded Fund (ETF) providers. As of March 31, 2012, $1.2 trillion was invested in about 1,400 U.S.-listed ETFs that track over 1,000 indexes. While all equity index ETFs on the market in 2002 utilized market capitalization weighting, only 30 percent of indexed ETFs used market capitalization weighting methods in 2011. In fact, indexed ETFs utilized 20 different weighting approaches and 27 different selection criteria, a stark contrast to the one weighting method (market capitalization) used a decade prior. 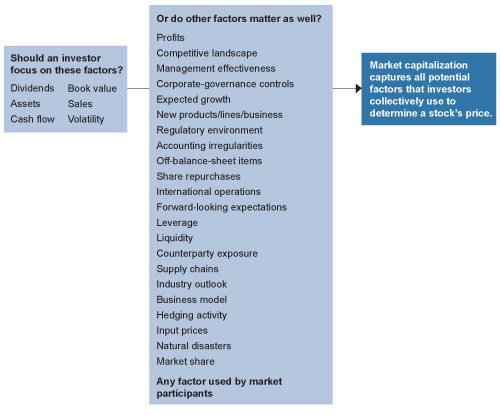 Rather than weighting holdings by market capitalization, most alternative indexes use a small number of factors to drive each stock’s weighting in the index. For example, a dividend-weighted index would weight high-dividend paying companies more heavily without regard to market capitalization. In contrast, the market capitalization index can be thought of as an all-factor model—the stock’s market capitalization is reflective of all factors on which the value of a company may be judged. Allowing only a select few factors to determine asset allocation may be counterproductive. If you were buying a car, would you base your selection solely upon the rating of its engine or tires? Or would you be better served to consider reviews of how the entire car functions? Today, alternative indexes and their accompanying ETFs are often created in an attempt to capitalize on recent market trends. In order to maximize the marketing opportunity before market trends dissipate, ETF creators have shortened the time frame between index and ETF creation. In fact, since 2008, roughly 60 percent of ETFs were launched within 180 days of index creation. For comparison purposes, in the period 2000-2003, nearly 65 percent of ETFs were created after their index had at least three years of live performance. Evidence suggests that alternative indexes are simply a restructuring of risk-factor exposure. While this allows for the introduction and marketing of a “new approach,” it often simply results in a less efficient and more costly portfolio. As a result, investors must take care to understand the structure and risks associated with the funds in which they invest—all indexes are not created equally.